While I’m participating in the WundaBody Challenge I’ve been cutting sugar out of my diet. I think that’s probably been the hardest part for me. Especially in the evenings I usually like to have something sweet. The first week I started the challenge I remember going to Trader Joe’s and seeing that they had just gotten all their seasonal food out. There was pumpkin butter, pumpkin ice cream, pumpkin everything! Trader Joe’s I love you but you’re just cruel. At that point I knew if I was going to make it through this challenge I would need a little something to curve that craving. And that’s where this Chai Tea Latte came in. It’s easy, yummy, and just sweet enough to make me feel like I’m not totally missing out on dessert. 1. Pour the boiling water in your mug and let the tea bag steep for 4 to 6 minutes in the water. 2. Next heat up the almond milk just until warm. Then pour into your mug. 3. Add 1 scoop of the organic stevia. The one I buy from Trader Joe’s comes with a little scoop. It’s TINY but adds plenty of sweetness (probably around 1/16 of a teaspoon). 4. If you want add a few drops of vanilla to taste. I love sipping on this in the evening while relaxing on the couch and catching up on our shows. It makes for a pretty good way to end the day. Oh my thanks for sharing! This sounds delicious!! Chai Tea Lattes from Starbucks are one of my favs but I do find they can be a little too sweet sometimes. I will definitely have to give this a go! I do love a good chai latte. I have found stevia a little bitter for my liking. You should check out xylitol (natural product and also great for your teeth and gums) which is sweet without the bitterness, and also organic coconut palm sugar, like brown sugar but with half the GI. Thanks Lexi! I have some xylitol but haven't used it i'm my chai yet. Next time I make some I will definitely give that a try instead! I have never heard of organic coconut palm sugar and actually I've been try to figure out a good substitute for brown sugar. Thanks for sharing this! I'm going to go pick some up. 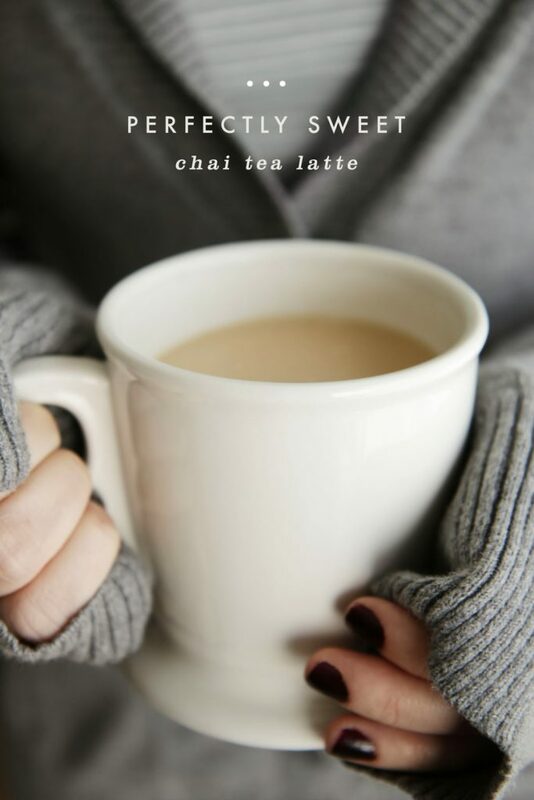 I've tried chai tea before and wasn't much of a fan, is a chai tea latte much different? I am allergic to almond. Is there another milk you recommend in its place? I've used regular cow's milk, and also evaporated milk (not the sweetened condensed stuff). If you're watching calories, you can use the 2% evap. milk. Pour the amount you want into a jar, give it a good shake (15-20 shakes), take the top off, heat in the microwave and you've got foamed milk! I love having this around the holidays! I wonder if it would be good with a candy cane in it to make a peppermint version. Then it will really feel like a Christmas drink. You can always add a drop of peppermint oil (I use young living) to avoid the sugar but get the flavor. Brilliant! I'm and going to have to get some. I've rarely found a homemade chai without tragic ingredients and sans dairy. LOVE this one – can't wait to try it! Hi Kerry! If you're not trying to avoid dairy you can just use cows milk. I've also heard of people using coconut milk. I've never tried it in a hot drink like this but I hear it is good. I'm really surprised to see a "Chai" latte without some sort of spice… After all, that's the whole meaning of "Chai" outside of the nation of India. Why are you skipping the cardamon? The spices are already in the tea bag. Perfect! Thanks for the share. Add one drop each of cardamom, clove, and cinnamon essential oils (I use dōTERRA). This makes a weak tea bag pop with flavor. Enjoy!